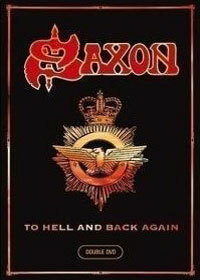 2007 was a good year for Saxon. In the Spring they released a new album ‘The Inner Sanctum’ and in November they launched a double DVD ‘To Hell And Back Again’ and re-released their 1997 album ‘Unleash The Beast’ with bonus material. There is enough to talk about with frontman Biff Byford, a man who formulates his rather short answers in a friendly manner. At the end of the DVD I noticed that you and Ronald Matthis are the producers of the DVD. That must have been a huge job, I guess? Yes, I was in charge for an overview and checking if everything was alright. That was my contribution to it. Yes, it was quite hard work, because there is a lot of footage. Lots of camcorder stuff and all the shows. I had to check them all and make sure that everything is interesting. We wanted a family thing, the crew together with the band. (laughs) Yeah, it has been three or four years of filming, so quite a lot of time. Yeah, we wanted to show that difference. At the ‘Lionheart’ tour we played small gigs and big gigs, this is quite interesting for ourselves too. It is always good for the fans to see the band in a small venue, because it is more intimate. But there is no big production, there is no eagle in the background. It is two different things, but we are lucky to do both. We can play massive shows in front of 70,000 people and we can play shows with 600 fans. Wacken Open Air is something special for you too, I think? Indeed, we played at the second Wacken, back in 1990. We have been together with Wacken for quite a long time and the heavy metal thing is so big at the moment again. Wacken is probably the number one festival in the world now and I think we probably helped to put it there as well. We like Wacken. The people that run the festival are really good friends and one of them manages the band. So we are very connected with Wacken. 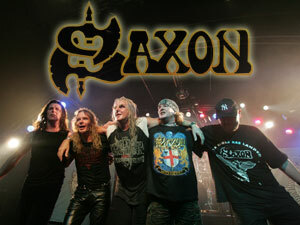 With Saxon you have been around the world, but which places did you mostly like on the ‘Lionheart’ tour? They are all great actually. There are crazy fans who want to rock ‘n’ roll everywhere. I don’t think there is one country more into metal than another one. Some people go crazier, like the Spanish and the Greeks and in South America go nuts on the shows. But the gigs we play in Belgium, on Graspop for instance, they are fantastic as well. We don’t really think in those terms, we think in gigs, not in countries. With a band like us, people come from everywhere to a show. Think about a London show, maybe 40% of the people in there are British. Everybody else is from America or Japan… By the way, we just come back from Japan, that was really great! We just did three big shows with Heaven And Hell and Marilyn Manson. And now you are going to Moscow again, I think? Yes, we go next weekend. That will be great! We had to postpone the tour, but I am looking forward to it. In December we do a tour and play in Antwerp, in Hof Ter Lo. It was planned in another venue, a new one, but there’s some problem with it, so we are booked for Hof Ter Lo again. (laughs)Yeah, we are very much into wine; I don’t drink beer, that’s why. Indeed we like a bottle of wine after the show. Very good. Helps you to sleep at the bus. Are you interested in visiting the towns where you play? Yes, we do it sometimes. We have been to Moscow and went to all the famous places. This time we just fly in, do the show and fly out. Are there plans for next year? Well, we are writing new songs at the moment for the next album. But I think on the card now is back to Japan next year, do a full tour and Australia. And South America, I look forward to that. I think we do one show in England on St. George’s day, which should be a bit special I think. St. George’s day is a very English day. St. George is the patriot saint of England, like St. Patrick is the patriot saint of Ireland. Andrew is the saint of Scotland. On St. George’s day everybody gets out wearing red flags. We all celebrate England. So we might do a ‘Crusader’ show that day. Yes, I like history. I think history and heavy metal go together really well. Yeah, indeed and you can go dark and light, it is good music to celebrate legends too. That’s a good cover actually, I like that! Me, Paul and Nigel – though Nigel wasn’t in the band when we did that one – are actually quite into progressive rock. The original progressive rock when we were younger. 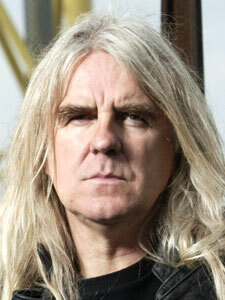 On the new album I think a song like ‘Atilla The Hun’ is quite progressive as well. Going into different kind of things. Together with the release of the DVD we have a re-release of ‘Unleash The Beast’. Why? Because ‘Unleash The Beast’ was on Virgin Records. We have done a deal with Virgin to get the albums back. They sold them to SPV. There is a bit more packaging and different songs on it. A lot of people probably missed ‘Unleash The Beast’, so it is good to buy it now. Virgin stopped selling it obviously, so it hasn’t been in the shops for a while. What are your feelings about internet and the new attitude of people? We adapted it for a long time. The website is really active, with the podcasts with the stupid things on there (laughs). I think it is a fantastic way to keep in touch with the fans actually. And for the fans to keep in touch with the band. A site like www.youtube.com is perfect for that. And I don’t really know if the downloads affect us too much, because our albums are selling well. I think people want the package. A lot of people download it and buy it as well. And the thing is, you cannot download the DVD, so you have to get the original. Christmas and New Years Eve are drawing near again. Are these important days for you? We do a show in Bulgaria on New Years Eve. It is a bit different for us this year, usually we don’t do anything and spend it with our families. But this time it is different, it is a festival and we make sure to get drunk (laughs). Are there new and modern bands you like? Yeah definitely, a lot of bands, mainly Scandinavian bands. And actually a band like Within Temptation is all about prog rock. It is very prog rocky music. I like that stuff, really moody and then heavy. I am quite into a lot of newer bands that are doing the prog rock stuff. I think there are many good bands nowadays. Even if they don’t really sing fantastic melodies, bands can still play fantastic music. What do you think about grunts? For me it is not my style of singing, I am more of a classic rock singer. But yeah, I like some of that stuff. But the attitude sometimes fits. I like it for instance when they got two singers, one for the growls and one for clean vocals. It is quite good. I was listening to Killswitch Engage, that’s a pretty good band. It is not Saxon style, but it is good music. Which bands are you going to tour with? I think on the next tour, it is a band called Evidence One, but I am not sure. And Pharaoh from Berlin, they are progrock. I think heavy metal music is really healthy at the moment. I think we are back to the days when people accept to listen to different kinds of music, especially at festivals. I think maybe six or seven years ago people wanted the same style, but now people are pretty open-minded and that is fantastic!